Romantic Gestures & Grand gestures of Love: Ideas for Love gestures: Rings, Flowers, Digital Graphics and more! Many times, love and romance consists of little signs of affection, small gifts and words. However, sometimes love can involve grand gestures. In love, grand gestures serve many roles, such as to celebrate a particular occasion or to reaffirm the love that is shared. One of the most important aspects of this is that it is extravagant in terms of either cost, or the time that is required to set it up. Relationships are built on memories, and recalling or reliving these memories is one way of sharing the past and the future with the person you love. Photobooks are one way of doing this. These books allow for the collation of specific photos and images from the past in a way that is memorable. It is most effective to look for old photos, pictures of places that you may have visited early in the relationship, and images that will be associated with good memories. Organization is also important. Photobooks are most effective if they tell a story, perhaps recapping certain events and memories, or progressing from the time that you first met to the present day. There are a number of different ways to go about this. Photobin offers a classic photobook that can be designed fully online with the user determining the size and position of each photo throughout the book. This is a convenient means of creating a gesture of love and affection that will be remembered and looked back upon. An alternative means of creating a similar effect is through scrapbooking. This uses a considerable amount more time and effort, but has the advantage in that it is a much more personalized product. While creating a photobook is an electronic process, scrapbooking is a physical one. It involves making physical copies of any images that will be used and organizing them on the pages of the book along with decorative elements, written comments and whatever else that is desired. There are many products that help you to begin this process such as the all occasion boxed album kit. 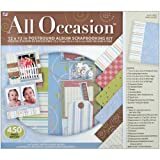 This is a starter kit for scrapbooking and contains an album as well as all the tools and accents needed to begin a scrapbooking project. All Occasion Boxed Album Kit 12"X12"
A different approach may involve the presentation of an expensive gift, such as a three stone white diamond ring. 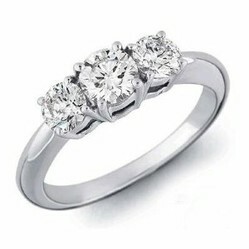 Although it is cliché, women do place special association on jewelry, particularly diamonds. For a loved one to have gone to the effort of choosing out a piece of jewelry, not to mention the financial cost that has been involved, is an incredibly romantic gesture and one that has a significant effect. Presenting the gift is another factor, perhaps a candlelight dinner where one’s spouse presents the ring along with a bunch of red roses. Red roses have a romantic image all of their own. They are associated with deep love and commitment. Whatever approach you decide to use, gestures of love towards the person that is important in your life can increase their self-worth, deepen the relationship between the two of you and let them know how much you care. Diamonds are nestled in a 14K White Gold ring that measures approximately 2.5mm in width, and has an approximate weight of 3.2 grams.